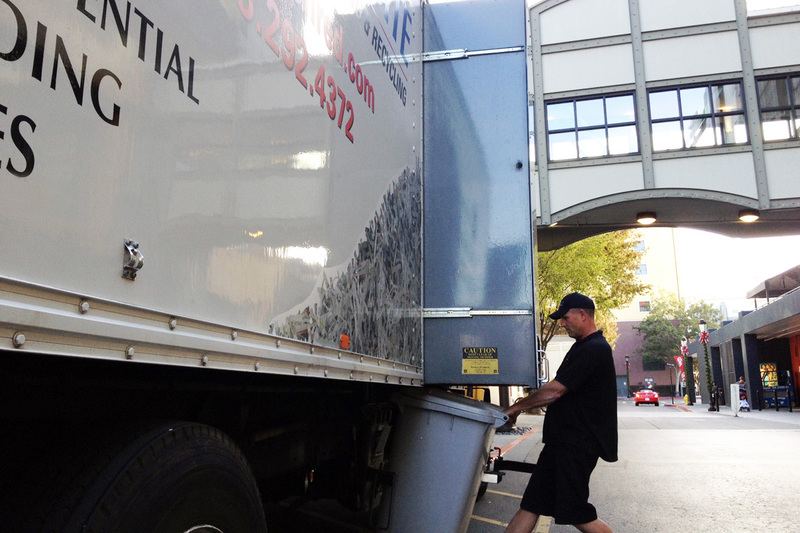 Quickly and easily solving your shredding and recycling needs. • Over 25 years serving the Bay Area. • Recurring or on-call purge service. • We recycle more materials. • Service inside or outside of your building. • Costs less than you are currently paying. InSITE can shred your documents and hard drives, recycle your paper and pallets, and dispose of your fluorescent tubes and batteries. We supply the bins and the service. It's that simple! We want customers to stay with us because they are happy with our service - not because they are locked into an "airtight" contract. Most accounts choose to have us service all of their containers, even the recycling, from inside of their building. There is no need to use a janitorial staff for the collection of recyclables. All documents, even non-confidential ones, are kept inside of the building, and are not stored outside where they are accessible to anyone. If you don't see it here, contact us - we can handle it.